Located in Ha Tinh Minerals and Trading Corporation, Thien Do Hotel 3 star standard has many advantages to attract tourists. 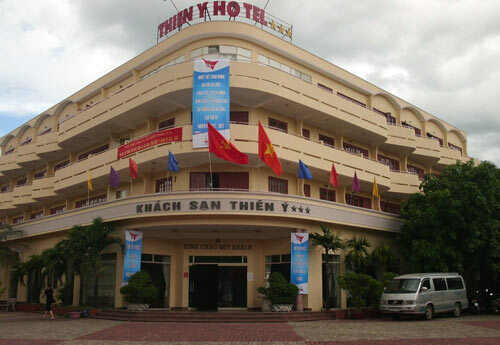 In addition to the traditional guests are travel companies, important guests of the government, national and provincial agencies … Thien Y Hotel is also an ideal place for tourists to combine conferences , seminars at home and abroad. Known as one of the most exclusive resort of Thien Cam beach, proud of its spacious airy space, charming landscape with wide greenery surrounded by white sandy beach in the center of the resort. The calendar as drunk visitors.In addition to the advantages of water-based painting, Thien Y is also seduced by the harmonious appearance between the architectural art has both classic and modern European style of Asia, elegant appearance outside and Elegant, meticulous with each interior details. Thien Y has two main seaside (seaside) and hillside (adjacent hill) areas with a total of 98 deluxe rooms ranging from deluxe to deluxe suites and different room types at reasonable prices. all visitors. In addition to the Thien Nhi hotel system, there are two restaurant systems: a restaurant located in the hotel area, warm and luxurious or the open sea with the melodious sound of the wind combined with the rhythm of the wave When the wool through the cliffs, besides there are 2 meeting rooms with capacity up to 300 guests are arranged luxuriously and warmly.